Trading or investing whether on margin or otherwise carries a high level of risk, and may not be suitable for all persons. Leverage can work against you as well as for you. Before deciding to trade or invest you should carefully consider your investment objectives, level of experience, and ability to tolerate risk. The possibility exists that you could sustain a loss of some or all of your initial investment or even more than your initial investment and therefore you should not invest money that you cannot afford to lose. You should be aware of all the risks associated with trading and investing, and seek advice from an independent financial advisorif you have any doubts. Past performance is not necessarily indicative of future results. Any opinions, news, research, analyses, prices, reports, graphs, charts, or other information contained herein is provided for informational purposes only and does not constitute investment advice or recommendations. McMillan Analysis Corp. (“MAC”) is not liable for any loss or damage, including without limitation, any loss of profit, which may arise directly or indirectly from use of or reliance on any such information. The content of this website is subject to change at any time without notice, and is provided for the sole purpose of education and assistance in making independent investment decisions. MAC has taken reasonable measures to ensure the accuracy of the information contained herein; however, MAC does not guarantee its accuracy, and is not liable for any loss or damage which may arise directly or indirectly from such content or from an inability to access such information, for any delay in or failure of the transmission or the receipt of any instruction or notification in connection therewith. Testimonials are believed to be true based on the representations of the persons providing the testimonials, but facts stated in testimonials have not been independently audited or verified. Nor has there been any attempt to determine whether any testimonials are representative of the experiences of all persons using the methods described herein or to compare the experiences of the persons giving the testimonials after the testimonials were given. You should not necessarily expect the same or similar results. This information is not intended for distribution, or use by, any person in any country where such distribution or use would be contrary to local law or regulation. None of the services or information referred to herein is available to persons residing in any country where the provision of such services or information would be contrary to local law or regulation. It is the responsibility of users of this information to ascertain the terms of and comply with any local law or regulation to which they are subject. Past performance results for advisory services and educational products are shown for illustration and example only, and are hypothetical. Policies for the various product types sold by McMillan Analysis Corp. and www.optionstrategist.com. Subscription services can be cancelled at any time for a prorated refund based upon the remaining unused portion of the subscription. If your cancellation is requested within 120 days of purchase you will receive credit back to the original card used for purchase. Beyond 120 days you will receive a McMillan Analysis company check. Due to personalization, books can not be returned. If a refund is requested and a book is not personalized, it may be returned within 30 days if it is in perfect condition. Videos can not be returned if the seal has been broken due to the ease with which they may be copied. If unopened, videos may be returned within 30 days. CD ROMS & Software can not be returned if the seal has been broken due to the ease with which they may be copied. If unopened, CD ROMS and Software may be returned within 30 days. Download purchases (software and seminars) cannot be returned for refund. Regular Online: With advance notice, you can cancel for a refund or reschedule for another seminar date. McMillan's Favorites: Once the .pdf of the slides has been accepted there are no refunds or cancellations. ** All policies are subject to change based upon a case by case basis. Refunds requested after 180 days will be fulfilled via company check. Please contact us for questions or concerns with any refund Info@OptionStrategist.com. Option Strategist is the sole owner of the it gathers on its site. Option Strategist will only share your information with outside parties in ways that are described in this privacy statement or if we are required to do so by law or in the good-faith belief that such action is necessary in order to conform to the edicts of the law, cooperate with law enforcement agencies, or comply with a legal process served on our Web site. We collect contact information such as name, mailing address, email address, phone number, and company information such as company name and Web site URL. This information is used to generate an invoice for you to print and submit with the rest of your application materials. 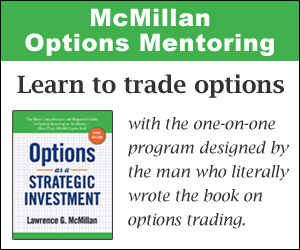 Some Option Strategist products are provided by Option Strategist and a Partner. This Partner may not use your information for any purpose other than to contact you about the product. Option Strategist will use the demographic data to learn more about the people and organizations that are interested in Option Strategist’s products to better target our marketing efforts. We may share aggregated demographic with outside parties to showcase the level of interest in Option Strategist’s products. No personal information will be shared. We use email links located throughout the site to allow you to sign up for our free newsletters and contact us directly with any questions or comments you may have. We read every message sent in and try to reply promptly to every one. This information is used to respond directly to your questions or comments. We may also file your comments to improve the site and program, or review and discard the information. Your personal information is only shared with third parties with your explicit permission. Individuals may also choose to opt-in to receive updates regarding new Option Strategist privacy products or Option Strategist’s monthly newsletter. If you opted-in to receive product updates or the newsletter, Option Strategist will use your email address to send the requested emails. To unsubscribe from these emails, click here. The Option Strategist Web site logs IP addresses and browser types for systems administration purposes. These logs will be analyzed to improve the value of the materials available on the website. A user’s session will be tracked, but the user will be anonymous. We do not link IP addresses to any personally identifiable information. We also use thrid party advertisements on optionstrategist.com to support our site. Some of these advertisers may use thechonolgy such as cookeis and web beacons when they advetise on our site, which will also send these advertisers (such as Google or Investingchannel) information including our IP address, your ISP, the browser you used to vist our site. This is generally used for geotargeting purposes, showing certain ads based on specific sites visited, or re-targeting. You can choose to disable or selectively turn off our cookies or thrid-party cookies in your browser settings, or by opting out through the NAI Consumer Opt Out (http://optout.networkadvertising.org/#!/). Option Strategist contracts with a third party to assist us in managing certain functions on our Web site, such as sending out our newsletters. Option Strategist only provides third party service providers with the information necessary to carry out the service (i.e. only email addresses are provided to the party sending the newsletter on Option Strategist’s behalf). Third party service providers do not use the information received from Option Strategist for any purpose other than those dictated by Option Strategist.